Creole recipes are famous and long-standing traditions in New Orleans cuisine. The style of cooking is a blend between the food traditions of West African, Spanish, French, Haitian, Amerindian, Italian, German, and Irish cultures. Creole food can be truly defined as true southern creations due to the blend of these cultural culinary inspirations in the southern United States. Developed in the 18th century, the traditional Creole stew is a staple of New Orleans culture. It’s name likely comes from a Bantu word for okra (ki ngombo) or the Choctaw word for filé (kombo). The blend includes stock, shellfish, vegetables like peppers, onions, and celery. Gumbo is generally thicker than other stews; it includes the vegetable okra, a Choctaw spice Kombo powder (ground sassafras leaves), or a French roux of flour and fat make up the base. The historical New Orleans recipe uses the French dark roux and often combines ingredients from various cultures. Although there are many different types of gumbo the Creole version adds shellfish, tomatoes, file, dark roux, or both. A version of the Creole dish, Cajun gumbo, is based on the dark roux recipe and includes shellfish or fowl. Often, spices and meats like sausage and ham are added towards the end. The dish normally cookes for three hours and file powder can be sprinkled on top after it’s removed from the stove. Traditionally, the dish is served over rice. The decadent breakfast dish is a favorite among those familiar with Creole food. Calas, also called Creole rice fritter or doughnuts, are dumplings cooked mainly with yeast, rice, sugar, eggs, and flour. The batter is then fried and topped with powdered sugar. Looking for the recipe? You can find it many traditional creole cooking books. The recipe originated from slaves who came from rice-yielding areas of Africa and became a staple among the working class. Female street vendors used to sell the breakfast treat in the French Quarter and yell “Bel calas, tout chauds!”, meaning “Beautiful Calas, still hot!” in Creole. Jambalaya is a dish influenced by French and Spanish culture that immigrated to New Orleans. The dish takes inspiration from the Spanish paella dish and the French jambalaia recipe.Mixed with rice, the dish comprises mainly meat and vegetables. Along with crawfish, shrimp, or chicken, sausage and andouille are popular meats to include in the meal. 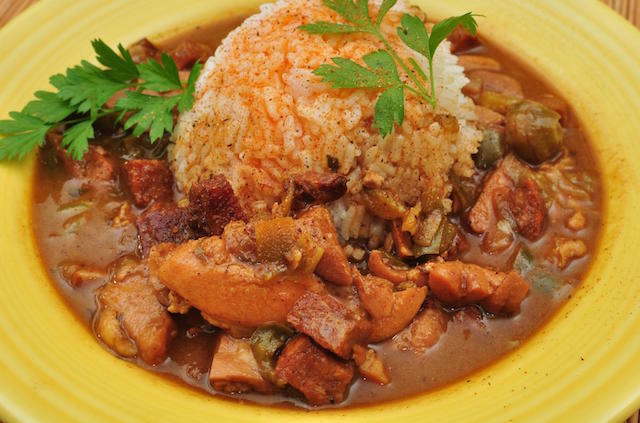 A common staple of Creole and Cajun dishes like Gumbo, the “holy trinity” is also incorporated into this dish. However, other vegetables like chilis and garlic are often thrown in too. Browned and sauteed meat and vegetables are mixed with rice and other seasonings while a broth is mixed in while the rice cooks. Since the rice is cooked with other ingredients, its distinguished from other similar dishes like Gumbo. Created at Antoine’s restaurant in New Orleans by chef Jules Alciatore, Pompano en Papillote is a delicious celebratory dish. Originally created for a banquet that honored Brazilian balloonist Alberto Santos-Dumont, the dish consists of filet of pompanois. It’s smothered in a white sauce of wine with shrimp and crabmeat. Baked in a sealed parchment envelope, it’s flavors make it a juicy and tasty entree meal. Many food critics may find the dish gimmicky or a relic of New Orleans cuisine. However, it is an important part of NOLA’s Creole culinary history In some ways it captures grand Creole cooking and helps tasters understand the cuisine and the historic grand dames of New Orleans restaurant fame. To understand New Orleans dishes is to understand its diverse culture. Finding and eating these dishes will help you get to know New Orleans and your favorite flavors. What are your favorite Creole dishes?